ATCHAM CHURCH STRUCK BY LIGHTNING. INJURY TO LIFE AND PROPERTY. On July 13th, 1879, one of the most severe thunderstorms which has visited this neighbourhood for many years passed over the district of Shrewsbury. In the early part of the day the atmosphere was very close, and there was every indication of an approaching storm. Between two and three o’clock in the afternoon the temperature became still closer, and thunder was heard in the distance, and seemed to be gradually approaching this locality. The lightning was at times extremely vivid, more especially in the district of Atcham ; whilst forked lightning was noticeable in the direction of Wem and that portion of the county. The rain fell in torrents, and so continued for some time ; and the storm seemed to reach its height about a quarter to four o’clock, when there was an exceptionally vivid flash of lightning, followed instantaneously by a tremendous peal of thunder, which shook most of the houses in Shrewsbury. It would appear that the storm was then raging furiously at Atcham, where a serious catastrophe occurred. In accordance with the usual custom, Divine service was held in the Parish Church in the afternoon, commencing at half-past three, and conducted by the Vicar, the Rev. F. B. Parkes. Before church time the thunder and lightning had commenced, and a number of people were consequently prevented from attending. There were, however, from sixty to seventy persons among the congregation, and the gallery was occupied by a number of boys and girls who formed the choir, and who were, as usual, accommodated with seats in pews immediately under the organ and in the front part of the gallery. After the service began the church became fearfully dark, and inside the building the atmosphere was so oppressive as to be almost overpowering. This continued up to the reading of the second lesson, at which time the lightning entered the church, having apparently travelled along the steeple, through the belfry and organ-loft, to the aisle, filling the church with sulphureous smoke and dust, occasioned by the falling debris from the gallery. This, as might be expected, caused a panic, and, amidst the screams of those who were injured by the fluid, and the terror of the other portion of the congregation, a rush was made for the door, and probably another accident by crushing would have ensued had it not been for the Vicar advising the congregation to keep their seats. It was then found that several of the children, who were seated in the front portion of the gallery, had been struck about the feet by the electric fluid, and their cries were of the most distressing kind. Assistance was immediately rendered, and those who were most injured were taken into the Vicarage close by, and a messenger at once despatched to Shrewsbury for medical assistance. The greatest sufferers were Emma Cain, Annie Cain (Atcham) ; Eliza Chaloner (Berwick Wharf) ; and Jane Good (Chilton). The two first named were the children of the late Police-constable Cain, and the eldest Emma, thirteen years of age, was by far the worst injured. She seemed to have been struck in the face, the fluid afterwards passing down into her right foot and tearing her boot to fragments, whilst her clothing was completely burnt. It was some time before she could be removed from the gallery. The other girls mentioned had their shoes, chiefly those on the right feet, literally torn to shreds, the soles being severed from the upper portion and the sprigs plainly visible. The suffering to which the poor children were subjected may be surmised, but, in addition, some were burnt about the body. Other persons in the gallery received a shock, and a young man named Pugh, a nephew of Mr. Delves, saddler, was found stretched in an insensible state on one of the seats to the right of the organ, alongside of which the lightning must have passed. His injuries were, however, of a temporary nature, and he soon recovered consciousness. The scene that followed was almost indescribable ; and as the news spread, the inhabitants flocked to the spot to glean particulars of the disaster. In the meantime a messenger had been despatched, with all haste, from Mr. Poole’s, of Chilton, to Shrewsbury, and he succeeded in finding Mr. Harries and Mr. Eddowes, surgeons, at home, and those gentlemen at once drove to Atcham, and gave such attention to the sufferers as their respective cases required. None of them, it is hoped, are fatally injured, but in most cases the shock to the system has been very great. Had the occurrence taken place in the morning, when the worshippers at church were more numerous, it is impossible to imagine what the result might have been, and, as it was, it appears to have been miraculous that no lives were lost, considering the direction taken by the lightning. From an examination of the building it would appear that the fluid struck the steeple on the left hand side of the west entrance of the Church, passed through the bell chamber in a line with the clock pendulum to the belfry floor, which it seems to have crossed, seeing that a quantity of masonry forming the basement of a window in this chamber was displaced. From this point it is traced on the roof of the Church and down the side of an arch and to the organ gallery floor. From marks on a screen used by the organist (Mr. Smith) as a rest to his back it would seem that he had a very narrow escape. The beading, together with some ironwork, was torn out of its place, and the woodwork splintered ; and therefore the current passed close to his head, in face his hair was singed. From this point the lightning descended into the pews occupied by the choir, tearing up the bearers in connection with the seats in the pew doorways, separating the partition which divided the seats, and, it is supposed, disappearing through the gallery floor and descending to the aisle. It would then appear that the fluid effected its exit through the oaken doors which form the western entrance, seeing that there was a large hole made in them ; and a piece of the splintered wood was afterwards found at some distance away in the churchyard, where the current exhausted itself. If this be so, William Caswell, son of the parish clerk, must have had a narrow escape, seeing that he was sitting in a chair on the right hand side of the western entrance, but sustained no injury. On looking at the organ gallery it is impossible to understand how the children and other occupants of the seats escaped instant death. Books and leaves of books were strewn about in all directions, whilst in the two seats fronting the organ, and occupied as stated by the choir, the floor, and even desks in front of the singers, were covered with small pieces of leather which had evidently been torn by the lightning from the children’s shoes. The edifice itself sustained little injury. During the excitement every assistance was rendered by the Churchwardens (Mr. Jones and Mr. Linell, of Emstrey). 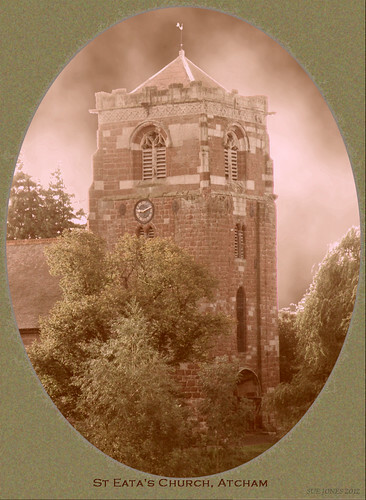 The news of the unfortunate event was not long in reaching Shrewsbury, whence a large number of persons proceeded to the neighbouring village to satisfy their curiosity, but the Vicar very judiciously closed the Church for the remainder of the day, and refused admittance to all comers.